To be honest, much of Tezuka's work is old. We can talk about how influential his series are on anime and manga, and we can discuss the depth of his themes, but the fact remains that many of his early works, including Astro Boy, just don't age very well. Astro Boy volume three, a Dark Horse release that compiles two stories from the Astro Boy universe, is no exception, but it is still completely worth reading for a quite unexpected reason. Specifically, this volume is a treasure trove for fans of Tezuka adaptations. The bulk of the book's 208 pages is filled with a story called "The Greatest Robot on Earth," which pits Astro against Pluto, a giant, horned robot programmed to destroy the seven most powerful robots in the world (including Astro), thereby making him king of the robot world. The kindly Dr. Ochanomizu tries to keep the boy robot from fighting Pluto, as the colossal enemy proves time and again that Astro's 100,000 horsepower isn't enough to defeat Pluto's own one million. Meanwhile, Pluto forms his first and only friendship with Astro's robot sister Uran, and faces a fundamental moral dilemma: to destroy Astro would be to rob his only friend of the most important person in her life. 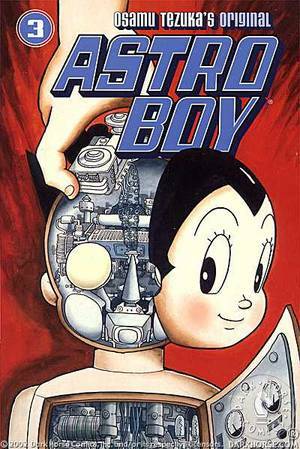 "The Greatest Robot on Earth" is, according to Tezuka's brief introduction at the beginning of the book, among his most popular Astro Boy story arcs, and its popularity has even spawned Naoki Urasawa's fantastic seinen retelling, Pluto. However, readers expecting the dark murder mystery tones of Pluto will be sorely disappointed to find a comic squarely aimed at children, as this was naturally the demographic for which Tezuka wrote Astro Boy. The pacing is also brutally fast, forcing much-needed exposition into a mere two speech bubbles in a single tiny panel. The truth is that this story has simply not aged well. It is often hard to understand what's going on as Tezuka barrels through the story at a breakneck pace, and many of the robots that Pluto destroys are barely given more than a page for character introduction before they are wiped out. Even the fight scenes, which Tezuka builds up with commendable tension in so few pages, are tragically brief, a shame considering the exciting style with which the artist depicts them. Despite all this, "The Greatest Robot on Earth" is worth it because, despite the shortcomings of the storytelling style, Tezuka has important things to say about love, friendship, family, and most of all duty (in Pluto's case) and self-acceptance (in Astro's case). Pluto faces a classic military conundrum: to obey a corrupt order or to do what you believe is right, while Astro must choose to raise his horsepower from 100,000 to one million, even though Dr. Ochanomizu insists that being the greatest robot in the world is all about his heart, not his horsepower. In the end, even though Pluto chooses to do the right thing, it is Astro's decision to embrace the philosophy of "might-makes-right" that leaves an appropriately unsatisfying conclusion to the tale. With so much going on between the lines, it is no wonder that this one story has been adapted into arcs in all three Astro Boy anime series as well as Urasawa's Pluto. Each of these four adaptations provides an entirely different look at the same themes. For example, Urasawa's manga delves into the private lives of each of Pluto's robot victims, while the 1980 Astro Boy anime reverses Astro's decision regarding his horsepower, painting a much less grim picture than Tezuka does at the end of this manga arc. The 2003 anime takes the story a step further, casting Dr. Tenma (Astro's father) as the scientist behind Pluto's creation. After such an adaptation-friendly chapter, it is only natural that the balance is taken up by "Mad Machine," a brief story about a machine craeted by Dr. Fooler (a regular character in Tezuka's "Star System") that causes every robot in Tokyo to go haywire. Dr. Ochanomizu manages to take Astro Boy apart before the Mad Machine is turned on, and sends the boy to destroy it as it takes a three-minute break to recharge. Keen readers will remember that a similar machine is used by Duke Red in Rintaro's Metropolis to fry the circuits of all of the robots in Metropolis. Unsurprisingly, the scientist at the helm of Rintaro's Mad Machine is the very same Dr. Fooler. On its own, volume three of Astro Boy is hardly enjoyable for anyone but Tezuka addicts and children, but in the context of the adaptations that it has spawned, this particular volume just might be one of the most important in the whole series. If you haven't read any adaptations of "The Greatest Robot on Earth" yet, the original manga version is easily the best one to start with. It will provide a basis of comparison as well as a few interesting themes to toy around with before you move on to Pluto or any of the anime story arcs. This review is based on a Dark Horse graphic novel purchased by the reviewer.